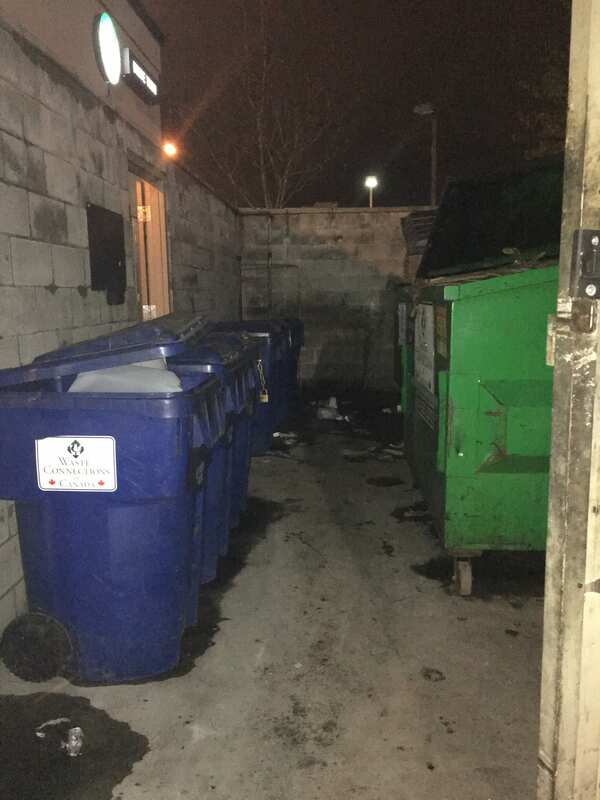 Okay basically in this picture is my place of work’s garbage, as well as it is the dead of night at 10:30pm. In this picture it portrays several of my fears including the darkness, being alone, claustrophobia, being dirty and being assaulted. I need to explain the last part because I work in the sketchy industrial area of Coquitlam and there is a lot of homeless people, some nice and others not because they will come and go through the garbage, making a mess and scaring the workers. And every time one of them comes around I need to go and politely ask them to leave, some of them do and others just run at me to scare me… and it does not help that there are several pockets in between the garbage bins where someone could be hiding and pop out and scare me. One of my coworkers was standing in the corner wearing all black and popped out and screamed at me. I threw the garbage at him and ran back inside. Honestly now that if there is anyone out in the garbage I would just leave them be and just not interrupt them. I think I learned that it’s not a good idea to throw the garbage out after everyone has left and there is nobody to get you if your left alone.